So, this is a recipe that I have been making for years. I have not had them for quite some time due to the fact that I did not know that I could bake with Earth Balance in the tubs. Although, now I am not so sure I want to have that kind of information. Don't get me wrong...these cookies are good! 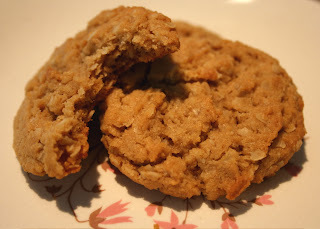 They are so good that our friend, Jim, has renamed them from peanut butter oatmeal cookies to "Crack Cookies". They are so good that when I made them a couple of weeks ago for an after lunch treat, the plate was almost eaten! The recipe is from Allrecipes.com and you should make them, but you have been warned! Thanks, Celine! They are so gooooood!